Since its invention in 1986 the atomic force microscope (AFM) is nowadays widely used for the inspection of sample surface down to the atomic-scale. 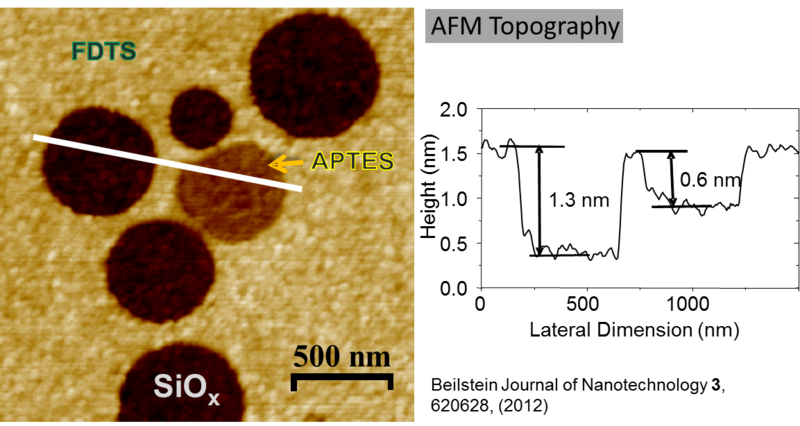 The experimental set-up of an AFM is based on a simple idea. It detects forces acting between a sample surface and a sharp tip that is mounted on a soft leaf spring (the so-called cantilever). A feedback system, which controls the vertical z-position of the tip on the sample surface, keeps the deflection of the cantilever (and thus the force between tip and sample) constant. Moving the tip relative to the sample in the x–y-plane of the surface by means of piezoelectric drives, the actual z-position of the tip is recorded as a function of the lateral x–y-position with very high precision. The obtained data represent a map of equal forces which can be interpreted as the surface topography. The lateral resolution (x–y) depends on the radius of the tip which is between 10–20 nm. The vertical resolution (z) is typically better than 1 nm. Fig. 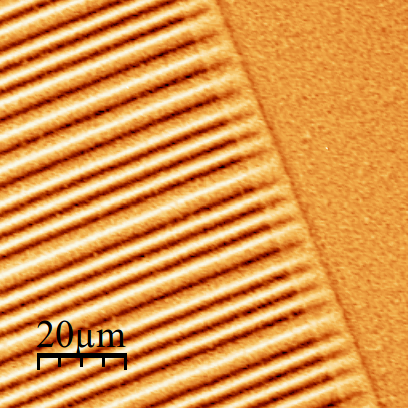 3: Topography of a Teflon-like self-assembled monolayer (FDTS) on Silicon. Pores with 1,3 nm depth were prepared by Polymer Blend Lithography (PBL). 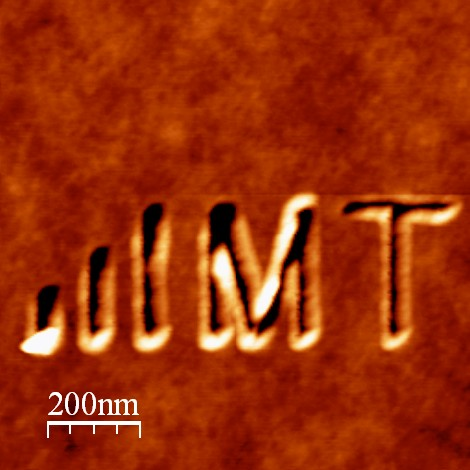 One pore is filled with a 0.7 nm thick amino-functionalized monolayer.